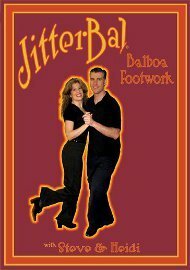 This instructional DVD is for the Intermediate Lindy Hop and Balboa dancer and contains fun and fancy Footwork to make you an outstanding Intermediate to Advanced Balboa dancer. You should know the Balboa, Bal-Swing and Lindy Hop Basics. To get around the “too fast” issue simply play it on a DVD player, on with DVD player software on your computer that allows you to slow things down. On the iMac, DVD Player currently does this without sound and on Macs or PCs VLC Player does it with slurred sound. We have several older “standalone” CD/DVD players that have variable speed play available and everything worked and looked fine on all of them. Better, our newest Sony DVD player – that cost all of $40.00 at Best Buy, including tax – played this perfectly at “.6” speed; probably the speed they should have used to “show” the steps in the first place. That speed was so good we could stand and step out the variations as they did them with very clear sound… And, who knows, maybe Steve and Heidi intended for people do “use their noodles” and do things this way all along? Anyway, slowed down the count numbers that used to flash by on the screen are more useful. You don’t really need the sound for much (all you hear is Heidi counting and you know how to do that) and the numbers on the screen are often better for matching. Since it’s all about either where your left foot or right foot is, there’s nothing really hard here; it’s just figuring out the pattern and getting the rhythm of the pattern down with practice. As for renting the disk at all, it can be argued, “If you can’t easily see the difference it isn’t worth learning any of this.” However, it’s not about how it looks, it’s about how it feels as you dance. Balboa is a “dancer’s dance” because the couple dancing together knows and appreciates what’s going on; everyone else can just do something else for three or four minutes. Having different foot patterns to play or work with – kind of nice. Don’t grab this disk thinking it’s about learning a beginner’s Balboa basic. It’s solely about learning extra (footwork) basics that you can dance in place to delight one another even more. That said, the more “basic reps” you’re already done, the easier this disk will seem.